and don’t have time to stuff around learning how to do online marketing. It lays out an action plan that you can follow, or that you can hand to your staff to implement. How to keep things moving so the plan doesn’t bog and go nowhere. 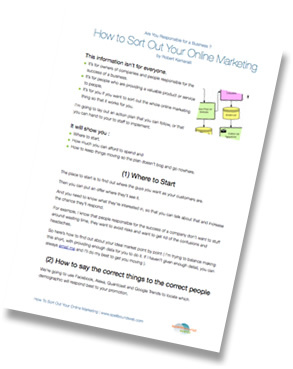 I’d like to let you know that I’m NOT a famous internet marketers and prefer to keep a low profile but I’ve been handling online marketing since 2003 and this checklist shows what I do to get an online campaign off the ground. Cut back the costs and save money on promotion. Put something in place that works. Where to Start ! How do you know where your best prospects are and what they’re looking at on the web ? How to know the correct things to interest them in. How to track what promotion is working and how much its costing you. So many businesses have no idea. How to keep things moving. and a survey we use to get things in motion. With 2014 half done, it’s worth getting going sooner rather than later, so get this checklist. Not having online marketing in place these days is losing you business and money. Yes, I'd like to read this checklist and apply it as soon as possible !! !